OUR PRICE: $40.50 - Join Rewards Get $4 Dance Dollars On This Item! 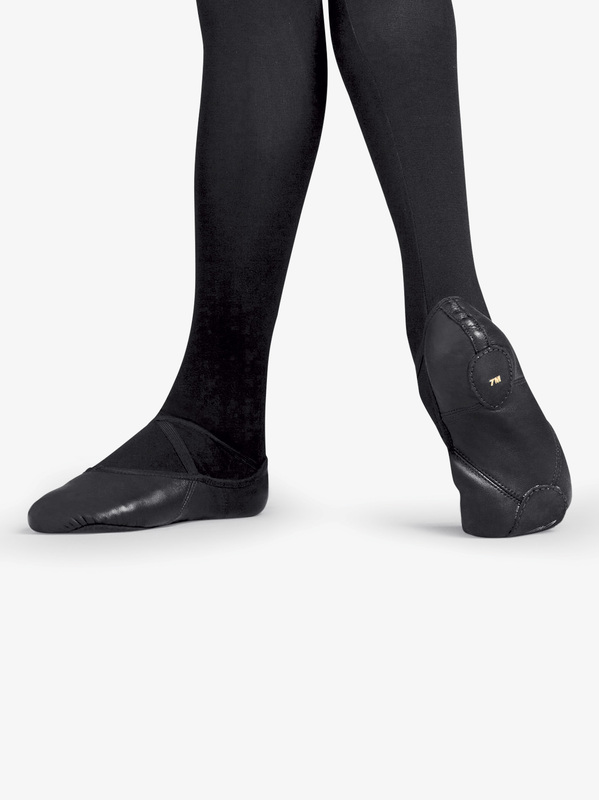 Capezio's "Romeo" split-sole leather ballet slipper with elastic drawstring. Elastics pre-sewn at sides of heel. We were looking for a ballet shoe for my pre-teen son who wears a men's 7 street shoe. Nothing on hand close so ordered sight unseen. Not only did we have to order up in size, we had to order W instead of M. Once we found the right fit, we've been very pleased with shoe comfort, construction, and durability. I own and use Capezio dance shoes with a modified heel as organ shoes. With aging comes a loss of foot sensitivity. I bought the Romeo Ballet Slippers as a possible substitute for my regular shoes and I think I've got a winner. I bought a half size larger (Mens 10 Wide) than my regular shoe size. For practice the shoes over bare feet seem just fine. For performance I plan to add thin black sox. For the look and to protect my feet a little more. It may be that I'll buy the next pair of shoes a full size larger -- 10.5 W. Having a little trouble accommodating to the feel but the accuracy is better especially on the long reaches. BTW the organ list I belong to indicates that some organists have been using this dance shoe as an organ shoe for many years. Romeo is a great shoe! So far, I've bought at least 5 pairs and they're comfortable to wear, they help in my turns and they last for a pretty long time. I would recommend them. It's a good slipper that makes a really nice foot. My shoe size is 8.5, and I always order 9M with this model. This is my third pair. I order Sansha canvas before and the design was not great, neither the durability. The Capezio are far better. The inside pad below the toes tends to move relatively quickly, but it is not a master piece in the shoe. I recommend you take it out when it starts to move or fold inside the slipper, and the slipper will still be very comfortable. I went down a size from street shoe size since I like my ballet slippers nice & snug. They stretch out fast. So if you don't like saggy shoes, DO NOT SIZE UP!!! Anyway, these shoes mold to your feet really well & complement your feet in many ways. They tend to bunch a little under ball of your foot around the sole area, but over all makes your feet look great. Lining is bit slippery though. So if you wear anything slippery underneath (tights sox), they'll slip a bit. These are my first ballet shoes so I can't compare, but they are quality and give good control. They seem better than the canvas that I've borrowed. They are tight fitting and I would get a larger size next time. What is the vamp length of these slippers? What is the vamp height of these shoes? The Sansha pro 1C and 1L have a vamp that is way too high for me. I have short toes and it always feels like I have way too much shoe on with high vamps. Thanks! The vamp is cut based on the size of the shoe. If you call our customer service department we can better assist you with specific sizing details. my son's feet are between 10 - 10.25" long. what size should we order for him? The sizing for this shoe is based on the street shoe size and runs true to size. I would recommend ordering his everyday street shoe size. What size is for me? My foot size is 26 cm. What is my street size according to US size system? 26 centimeters is equivalent to a womens 10 or a mens 8. The Romeo is suggested by the manufacturer for men to order same as street shoe size.